As several awareness campaigns have shown in the last few months, we tend to take for granted just about everything from the water we drink to the shoes on our feet; but it’s not just the material things we take for granted either – it’s also the people around us. In the rush of our daily lives from classroom to lecture theatre to classroom, we often forget to even smile at those who work tirelessly behind the scenes to make everything run smoothly, and attempt to justify our behaviour with convenient excuses like “Oh, I didn’t realise,” or, “Sorry, I was busy and forgot.” In doing so, though, we run the risk of overlooking the people who silently maintain and contribute to crucial aspects of our everyday school experience. This Appreciation Week, it’s time for us to recognise the people who do the things that, frankly, if put in their position we’d much rather not do. A lot of us use the job of “cleaner” as a crude joke when talking about someone else’s (or our own) lack of capability to do ‘anything else’, forgetting that indeed, there are people out there who are cleaners. These are the people who help make sure that everything else is in order so that students and staff alike can focus on learning, teaching, doing well at A levels, etc. – essentially, tasks we seem to be more important. They keep the classrooms clean, keep the facilities working, or help us print the lecture notes that give us the assurance of not being left behind despite falling asleep in every lecture. Let’s face it – we don’t take enough time to acknowledge and smile at the cleaner that comes into the classroom to clear the bin, or the security guards that walk around to make sure there are no unwelcome intruders on the premises, and much less the maintenance staff who do work that we don’t even see. Some of us don’t even say thank you to the canteen staff who prepare and serve us food (whether we like it or not), thinking of it as “their job”. Yes, it’s their job to do it because it’s what they’re employed to do. That doesn’t excuse not saying thank you to them, or taking them for granted, because, realistically, they don’t actually have to do their jobs well. They don’t have to come in everyday to do all these little things, but they do, and that’s important. If they weren’t around, the differences would be incredible. Imagine that – classrooms with dirt and dust everywhere, overflowing trash bins, no food in the canteen and (heaven forbid) drainage pipes that stop working in the toilets. So this week, we challenge you to appreciate the people we take for granted more. We challenge you to say thank you when the cleaner comes in through the door, or when asking the lady in the photocopying shop to help you photocopy some notes. We challenge you to say hi to them, smile at them, and above all else, make them feel like they’re noticed and appreciated for the things they do. Their jobs aren’t easy, and they make our lives in school so much better thanks to what they do, so let’s not take them for granted anymore. 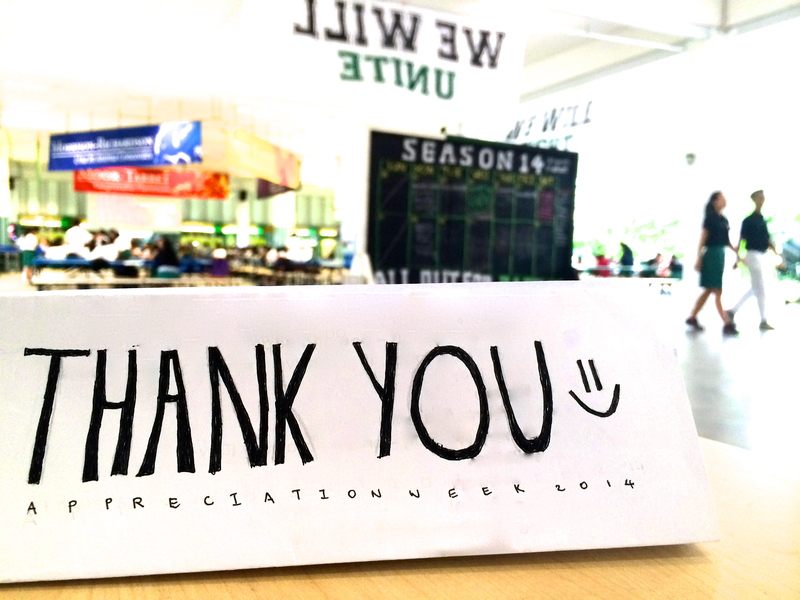 Appreciation Week is a collaboration between students from The Humanz Initiative (THI) and Raffles Press that bids to recognise and appreciate the non-teaching staff members who do a lot that we often don’t value enough. From tomorrow, we will be putting up features of several members of staff who do these jobs, from a member of the Finance department to the staff in the SAC. Do look out for them! In addition, there are boards in the canteen walkway featuring the different departments of non-teaching staff that we’d like everyone to show their appreciation for this year. Do head down and add a little note of thanks via the cards that will be available, to show your appreciation for the work they do. Alternatively, feel free to leave your message of thanks in the comments of each article, and we’ll put it up on the board from there!